Hello everyone! 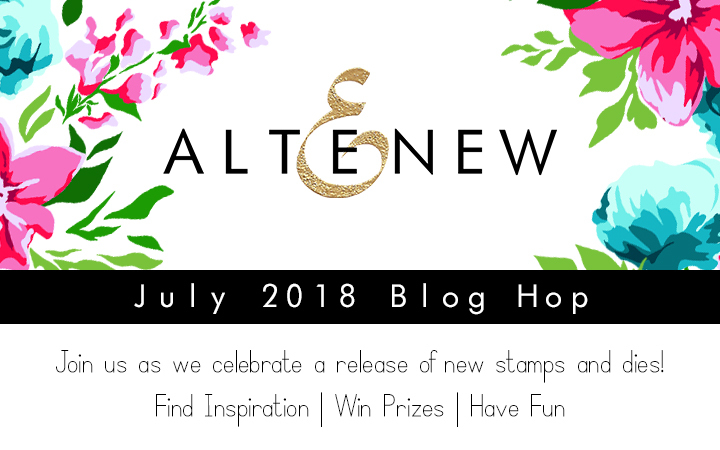 Are you hopping along in Altenew’s July release blog hop? There are lots of gorgeous, new stamps and dies being released today… I have 4 cards to share with you featuring these new designs! You can see the entire release HERE. I’m a guest in today’s hop. If you have already been hopping along, you should have arrivd from Enza Gudor’s blog. I really had fun creating with the lovely, Beautiful Heart stamp set! 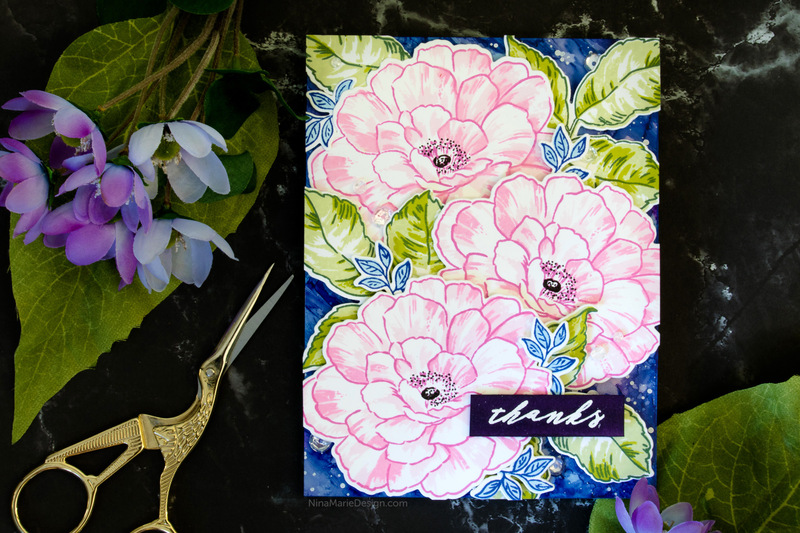 Altenew’s Crisp Inks worked together with layering images to make stunning florals. I stamped a few blooms and leaves onto Simon’s white cardstock. With the coordinating dies, I trimmed the florals out and layered them with foam tape onto a background I had created with Copic markers on Yupo paper (used like alcohol inks). If you didn’t catch my recent video showcasing this Copic marker alcohol ink technique, you can watch it HERE. In the video I feature Altenew stencils and how to stretch your Copic markers to create controlled alcohol ink designs! 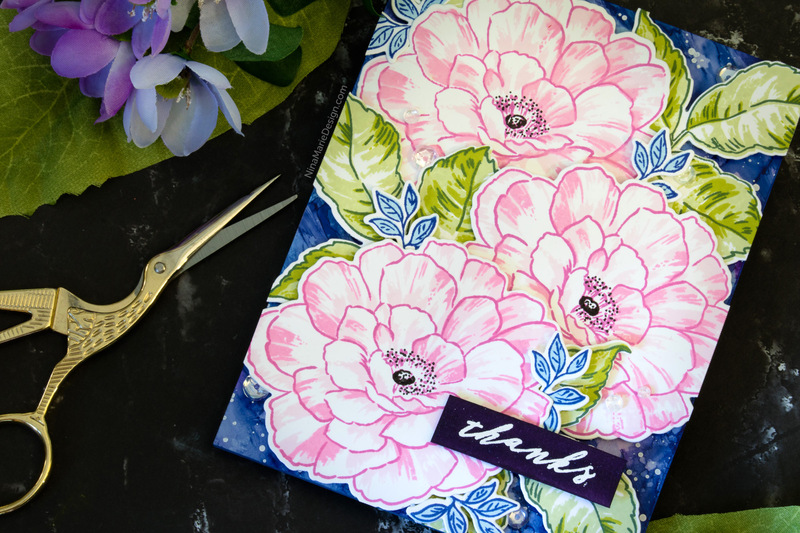 The florals on this card are so big, that I left them be the star of the show. I simply finished everything off with a simple greeting from Altenew’s Garden Silhouette set, and a few Ice Crystal sequins from Lucy’s Cards. I couldn’t stop at just one card using the Beautiful Heart stamp set! This next card uses it along with the also-new, Kind Words Altenew set. Again, I used Altenew Crisp Inks for the stamp layering. For both cards I made sure to stamp everything with my Mini Misti tool. While I use this stamp positioner on almost every card I make, it is invaluable for stamp layering techniques like this. I layered these flowers onto a Tintables panel from Concord & 9th that I colored with some purple Prima watercolor. The resist pattern of these Tintables are so much fun! There are greetings from the Kind Words stamp set, and sequins from Simon Says Stamp’s Clematis and Peony Bouquet sequin mixes. 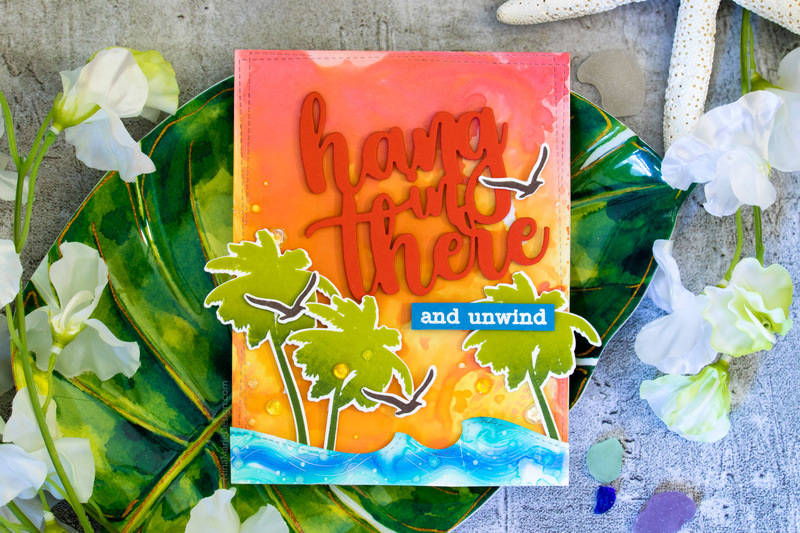 With Summer in full swing, it only seemed fitting to create a tropical-inspired card with the new Gradient Sunset stamp and die set, along with the Hang In There sentiment die. I created some ombré palm trees with two shades of Altenew Crisp Ink (along with the aid of my Misti!). The die cut ocean waves are a scrap of a Copic marker, alcohol ink background I had made. This background had some fun texture added to it while the inks were still wet with Blending Solution. The texture was created with Mermaid Texture brushes from Jane Davenport. Love the effect it gives! My scene is layered onto an Oxide Ink smooshed background (see THIS video for Distress Oxide smooshing inspiration), and I added the Hang In There greeting along the top. 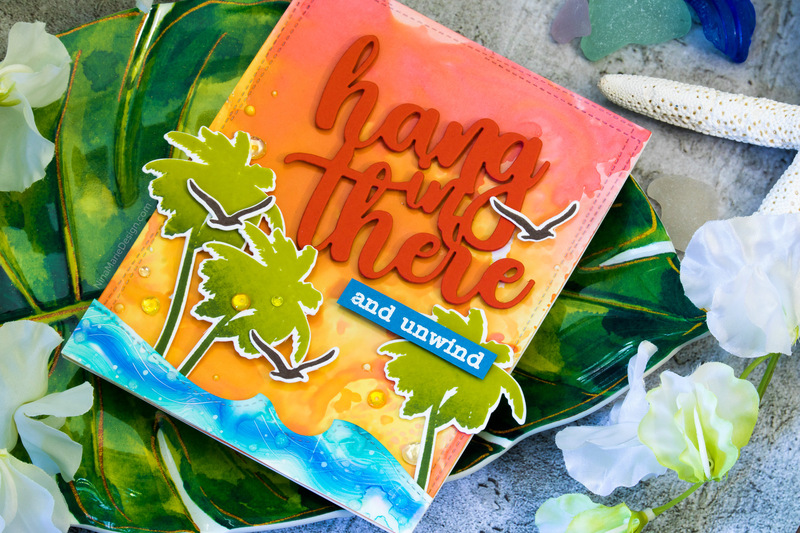 To accent the sentiment, I white heat embossed a greeting from the Gradient Sunset set onto Island Blue cardstock. 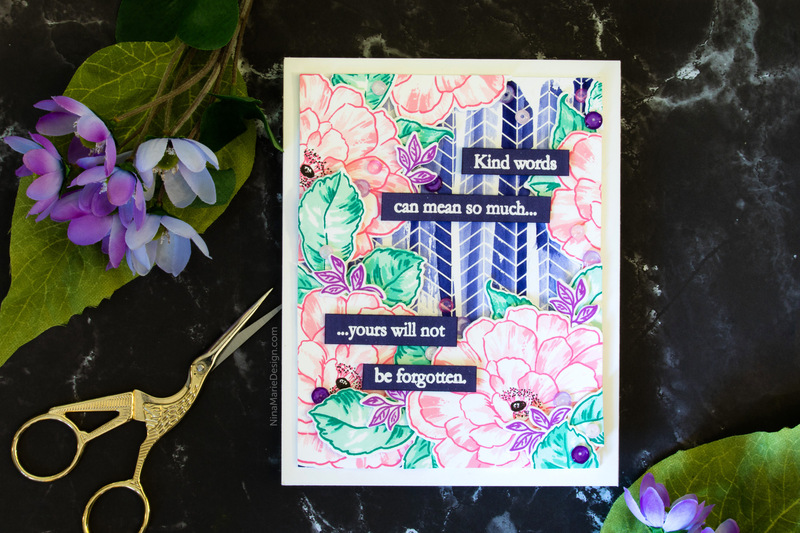 I love the way these two sentiments paired together, giving a fun, relaxing vibe to the card! The final embellishment on this card were a few sequins from the Summer Gold mix that Simon Says Stamp recently released. I don’t know about you, but I would love to be on this beach! This final card I made with the new Altenew release may be the simplest of the bunch, but it is my favorite of all. Not only do I love the message on the card, but the best part is that my 3 year old sister helped create it. She LOVES to watercolor. We often sit on the floor in my studio and paint backgrounds together. She always has a blast! This purple and blue background was part of a big sheet of paper we worked on together, and I cut part of it out to use on this card. When we create together, she uses my Gansai Tambi watercolor set (she say’s they are her paints, and all the other palettes I have are mine); for paper I let her paint on the Canson Mixed Media paper. This big pad of paper is pretty inexpensive and holds up to lots of watercoloring quite well (and believe me, as a toddler she loves to use A LOT of water!). If you have little ones that want to get crafty with “grown up” supplies, the Gansai Tambi watercolors and Canson Mixed Media paper are great options for our up-and-coming little artists. 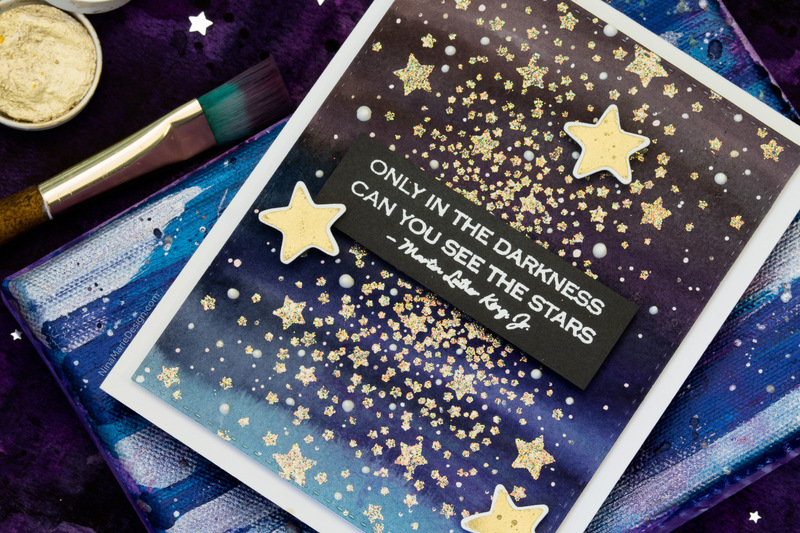 Onto the background I embossed one of the star clusters in the Kind Words stamp set using the gorgeous Cloud 9 embossing glitter from WOW. This embossing powder is super-unique in color, with gold undertones and lots of sparkle! 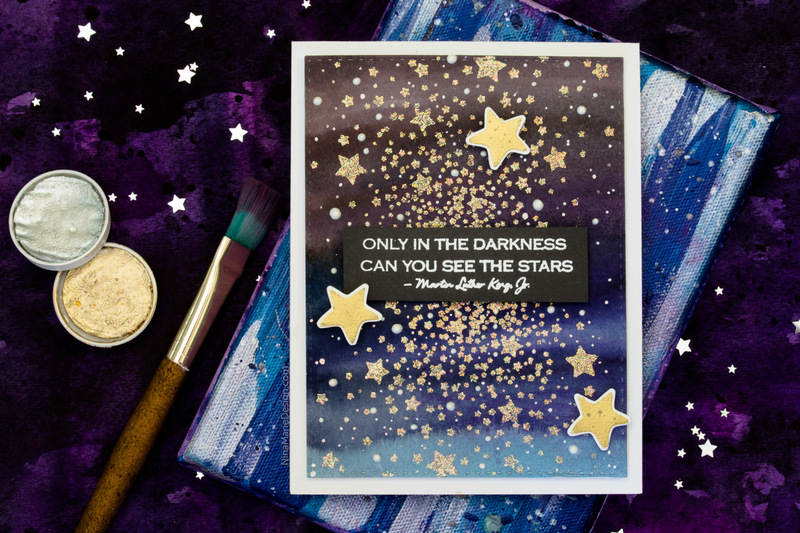 I added a white embossed sentiment into the center of the card, along with a few gold embossed stars from the Snapshot stamp and die set. The final touches were some white gel pen and white Nuvo Drop details around the stars to help fill things in even more. There is LOADS of additional inspiration to see on this blog hop! Your next stop is the super-sweet and talented Virginia Lu, whom I adore. You can reference the entire hop list at the Altenew Card Blog. To celebrate this release, Altenew is giving away a $50 gift certificate to 6 lucky winners! Please leave a comment on the Altenew Card Blog and/or Altenew Scrapbook Blog by Thursday, July 26th for a chance to win. 6 winners will be announced on the Altenew blogs on July 29th. You can also have a chance at winning a $30 gift certificate by leaving a comment here on my blog! Please leave a comment by July 25th for a chance to win. I’ll draw the winner shortly thereafter. Winner will be notified by email. Thank you SO much for stopping by today! I hope you enjoyed all of this inspiration and will come back soon, as I have lots more creative ideas and video tutorials coming up! See you soon! So love the Beautiful Heart stamp and all the gorgeous creations – yours is wonderful. Love that you and your little sister spend time doing things together and the card your created is spectacular! Thanks for sharing ! Beautiful cards…such talent! Thanks for the inspiration! I love the cards, especially the first one. I am new to stamping, & although I only have one stamp set that I purchased locally this month. I look forward to collecting many new stamps. My favorites from the July releases are Beautiful Day & Needlework Motif. Beautiful cards Nina!!! I love the card you created with your sister, its gorgeous and so special that you and your little sister created it together. 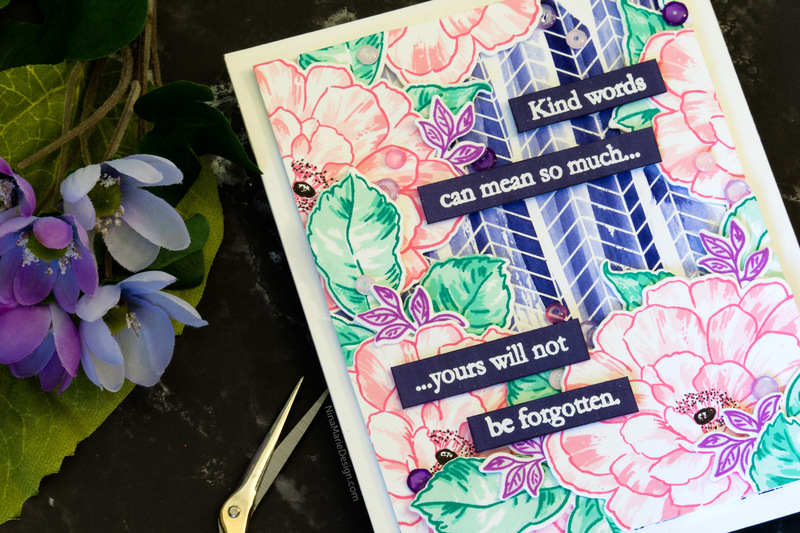 The kind words stamp set has the most wonderful sentiments and I love the burst of stars. Amazing cards! I love the colors on all of them! Fantastic cards! Love all of your backgrounds and the colors are awesome.